When we use the word "diner", it can mean many different things. If we look at the classic diner that we normally find in the U.S., it brings up images of booths, a long counter with chrome stools. It can also merely mean that it is a place that serves up traditional American food such as burgers, shakes, breakfast and the sort. However, up here in Canada, the "diner" may not fit into either category. In fact, it is so muddled up, it can resembled something like the Snak Shak where, in addition to burgers, we get Wor Wonton Soup and Teriyaki Chicken. Ah yes, Multiculturalism at work... What we have here are diner-type joints run by Asians. Th us, we get a bit of this and that in addition to a hearty breakfast. 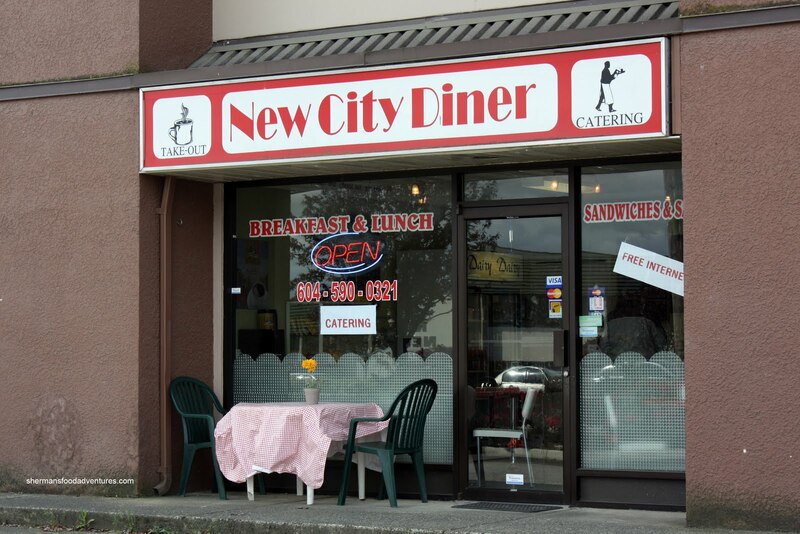 The New City Diner is another example of this. Run by a friendly staff of Koreans, this place generally serves the nearby lunch crowd. Here you will find breakfast, sandwiches, burgers and California rolls. We weren't in the mood for diner Cali-rolls today, so we stuck with the regular fare. Seeing how no one wanted to try the Breakfast, I decided to order it for variety purposes. 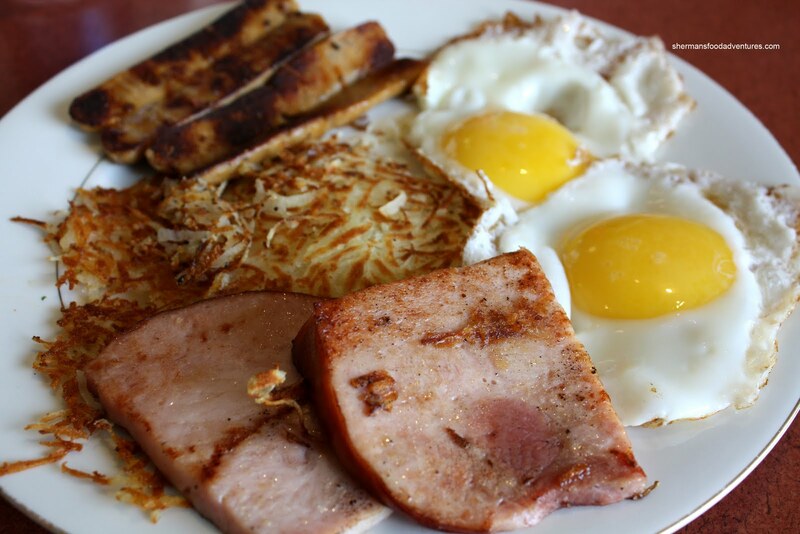 I got the 2 Plus which consisted of 2 eggs, 2 sausages, 2 ham (or 2 bacon strips), hashbrowns, toast and coffee. As per usual, nothing ground-breaking with this breakfast; yet it was quite good. The eggs were prepared correctly and the ham was quite thick. Normally, I'm not a big fan of hashbrowns; but I really liked this one. It was ever-so-fluffy with a nice crisp exterior. Waffle Guy went for the Cheeseburger with baked potato wedges. As you can see in the picture, that is real cheddar atop a well-charred patty. 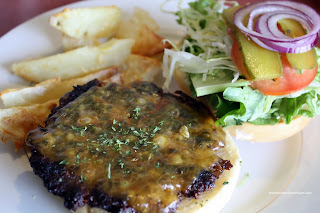 Combined with incredibly fresh toppings and a soft bun, this was an unexpectedly good burger. Although they will never replace actual fries, the baked wedges did the job. Incidentally, they pride themselves on fresh ingredients and healthy food (as healthy as you can get considering the menu). 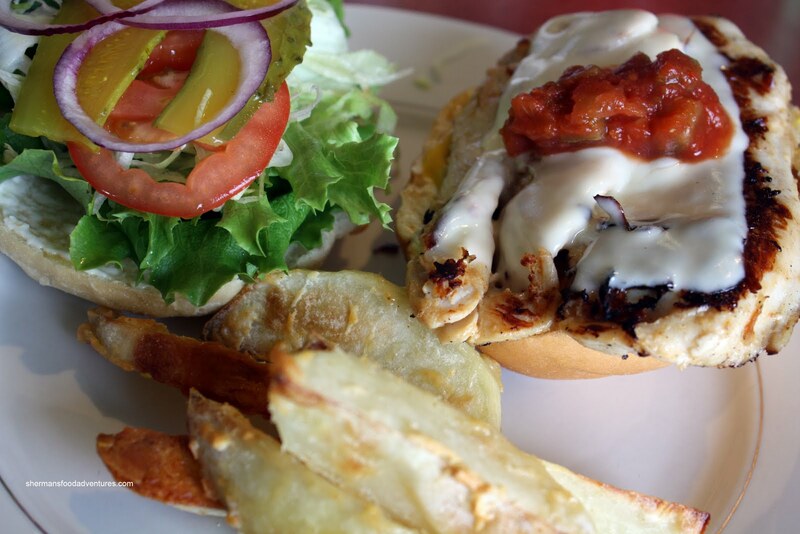 The Chicken Burger was equally good with a nicely charred; yet tender chicken breast. Same fresh ingredients made for a solid burger. 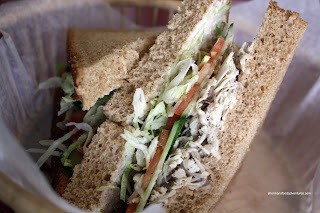 In addition to their hot food, there is a large selection of sandwiches and subs. As you can see in the picture, the Chicken Salad Sandwich is not your typical bits of chicken slathered in mayo. Rather, there is a modest amount of dressing. Consequently, there is more meat and less fat. Combine this with the same fresh veggies as the burgers and really soft bread (it was really fresh! ), it's a good sandwich. The burgers and sandwich were part of a lunchtime special that included soup. There is not much in the way of style or food that will blow you away; yet, it is carefully made and inexpensive. Definitely a great find for breakfast and/or a quick lunch. Hey...I've never even heard of this restaurant before! They serve California rolls as well? It reminds me of that place on Denman that sells breakfast all day as well as Japanese food. So random! The cheeseburger actually does look really good and their focus on fresh ingredients is unexpected but obviously very appreciated. Yah Mijune, it's decent food on the cheap. Nothing mind-blowing, but good for a quick bite. I <3 this place. The burger's are SO good & just satisfying without being greasy or heavy or leaving you bloated. They actually never have california rolls =). Good quality home-made food, served by a nice family. They close at 3pm though, it is essentially a cafe serving the workers in the area. If you go in during lunchtime you will see baskets of food with plastic over it for people who have pre-ordered =) for eat-in. I usually phone my orders ahead to avoid waiting as everything is freshly prepared. The pea and ham soup here is so good! Agreed on the Pea soup. It was very good! About the CaliRolls, they do have them, only on certain days though. The day I went, they didn't have them, but I assure you they do!